Agricultural regions mapped below are based on the most important type of farm in 2001 in each rural municipality, with smoothing of boundaries between regions (Figure AR-1). Statistics Canada classifies farms from data in its agricultural censuses. Farm type is determined by the single crop or type of livestock (or, if necessary, group) that provides 51% or more of total farm cash receipts. For example, a farm on which 60% of potential farm cash receipts are from wheat would be classified as a Wheat farm. 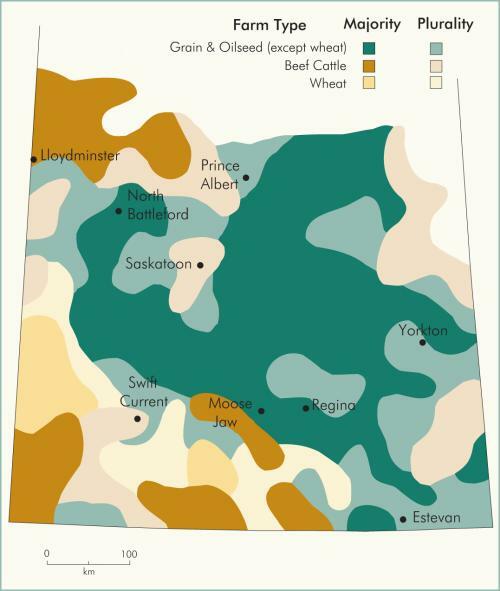 Before 1996, most of Saskatchewan's farms were classified as wheat farms. However, recent years have seen a sharp percentage decline in wheat farms and a corresponding increase in grain and oilseed farms as well as beef cattle farms (Table AR-1). The decline of wheat farms is almost entirely explained by a reduction in spring wheat. Grain and oilseed farms have dramatically increased, partly because of a rise in economic importance of cereal crops other than wheat, specialty crops and oilseeds (Table AR-2). On many former wheat farms, these crops now provide the majority of farm income. On other farms, wheat is still the main source of income but now accounts for less than 51% of farm income, so wheat earnings must be combined with income from other sources to determine a farm type. In most cases, these farms have become grain and oilseed farms. Beef cattle farms have also increased, in part because of farmers diversifying away from wheat. Figure AR-1 shows that in 2001 beef cattle farms formed the majority or plurality (less than a majority but the main farm type) of farms in three main areas: in the southwest, aridity and rough topography favour beef cattle ranching; the eastern plurality regions are located on or flank prominent uplands, e.g., Moose Mountain; and in the northwest, Climate and soils are suitable for beef cattle farms based on tame hay and feed grains. Wheat Farming, based mainly on spring wheat and durum wheat with frequent summer fallowing, is the mainstay on flatter lands in the dry south and southwest. Grain and oilseed regions dominate overall (Figure AR-1). Plurality grain and oilseed regions typically separate the majority regions of this type from wheat or beef cattle regions (Figure AR-1). Agricultural regions based on the two main types of farms combined reveal a close relationship between these regions and the main soil zones (Figures AR-2 and AR-3). Grain and oilseed farms combined with beef cattle farms are dominant (50-75% of all farms) or predominant (76% or more of all farms) over much of the relatively cool and moist Black and Grey soil zones (Figures AR-2 and AR-3). 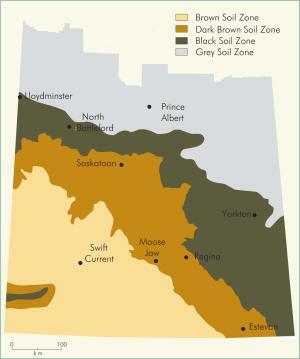 Smaller regions occur in the drier Dark Brown and Brown soil zones, with beef cattle farms generally on the rougher lands and grain and oilseed farms on the more level land. Regions of grain and oilseed farms combined with wheat farms tend to be located on the moderately moist Dark Brown soil zone as well as in adjacent and moister parts of the generally dry Brown soil zone (Figures AR-2 and AR-3). Wheat and beef cattle regions occupy small patches in the core of the Brown soil zone in areas either too dry for most cash crops except wheat, or too dry or rough for other than beef cattle. Carlyle, W.J. 2002. “Cropping Patterns in the Canadian Prairies: Thirty Years of Change,” Geographical Journal 168 (2): 97-115; - - . 2004. 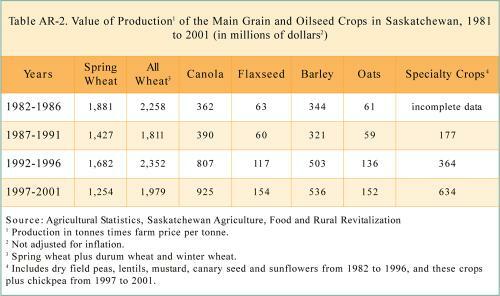 “The Rise of Specialty Crops in Saskatchewan, 1981-2001,” Canadian Geographer 48 (2): 137-51; Fung, K. (ed. ), 1999. 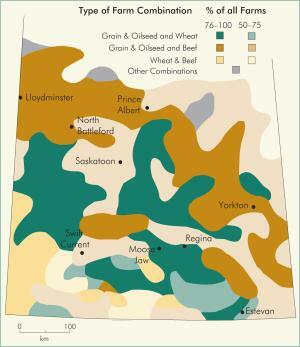 Atlas of Saskatchewan. Saskatoon: University of Saskatchewan; Statistics Canada. 1994. Canadian Agriculture at a Glance. Ottawa: Statistics Canada, Agriculture Division.